Solar suitcases, devices designed to generate solar electricity, are being used to power impoverished hospitals. The devices are being sent to developing countries such as Haiti. Hal Aronson explains the idea behind the solar suitcases. Assistant University News Edito Mihir Zaveri speaks with Mollie Bloudoff-Indelicato about Hal Aronson and Laura Stachel, contributers to the solar suitcases project. Plato said that necessity is the mother of all invention, and for Berkeley residents Hal Aronson and Laura Stachel, truer words were never spoken. When the husband and wife duo found out about the Haiti earthquake, they withdrew $10,000 from their own savings and bought supplies to build "solar suitcases"-devices designed to provide hospitals with solar energy. So far, they have sent 12 suitcases to developing countries, four of them going to Haiti, Stachel said in an e-mail. Costing an average of $500 each without excess equipment, the mini solar generators can power operating room equipment, blood bank refrigerators, communication devices and laptops, among other devices, Aronson said. "The demand (in Haiti) is higher just because of the crisis, so our main goal is to prevent the loss of human life," said CJ Jennings, a junior in conservation and resource studies and volunteer with the project. Relying solely upon donations, the project utilizes volunteers to raise money for supplies and help build the mechanism within the suitcase. The lack of funding has not curbed volunteers' enthusiasm, Aronson said. "It's self-empowering," said Bruce Rhodes, vocational trainer for the Community Action Partnership of Sonoma County. "It's about people taking control of their own environment. It's a beautiful thing." Aronson and Stachel founded Women's Emergency Communication and Reliable Electricity (We Care Solar) a year and a half ago to provide impoverished hospitals with electricity in an attempt to reduce high infant and birth mortality rates. 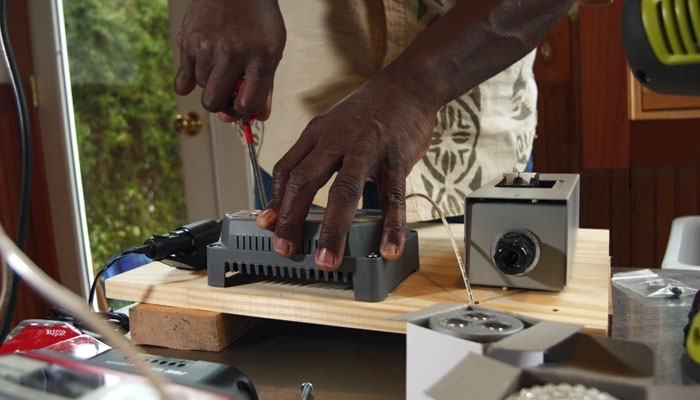 Stachel came up with the idea while doing research in Nigeria, and her husband, having 25 years of experience in solar technology, built the devices and packaged them in suitcases. "Women give birth or have life-altering surgeries by candlelight," Jennings said. "Reliable electricity prevents so much from going wrong." The solar suitcases are powerful enough to provide an average of 30 hours of continuous light from a 3-watt LED bulb, yet simple enough that Aronson can train high school students to do the wiring, he said. However, there's no room for error-one mistake and the unit could short-circuit, rendering it worthless, he said. "It's life and death," he said. "That's our motivation. We want to make them as durable and long-lasting as we can." Instead of shipping the solar suitcases directly to Haiti, Aronson said he sends them with various medical teams, which ensures they are put to immediate use. The concept has also caught on in the U.S. As early as this March, Detroit could utilize a variation of the solar suitcase to provide power for its houses-a basic necessity that might otherwise be unaffordable. For Aronson and Stachel, We Care Solar is not about making money-it is about making a difference in the lives of those who cannot help themselves. "Sometimes people ask me why I do this," Stachel said in an e-mail. "I tell them I do this because I have been (a) witness. I have seen what care is like in Nigeria, and I cannot turn my back. ... Somehow, through We Care Solar, people have taken notice ... And in some way, I feel that I have given these women their voice."